The push for origin labelling represents a new challenge for developing countries. This article describes an origin-labelling scheme under consideration by Emater, a Brazilian public body established to support small farmers. The product in question is Serrano cheese, a local speciality from the Campos de Cima da Serra region in Rio Grande do Sul (the southernmost state in Brazil). Some 70 semi-structured interviews were conducted to explore respondents’ attitudes to Geographical Indication (GI), and assess its relevance as a means of preserving the cultural identity of Serrano cheese. Our findings revealed the limitations of the scheme due to its top-down design, suggesting that Emater has failed to grasp the full implications of GI classification. While the aim would be to promote and preserve local history and culinary heritage, the outcome may be quite the opposite: GI labelling may lead to standardized production methods that would cut local producers out of the loop altogether. Dans les pays du Sud, les initiatives visant à établir ou à renforcer les liens entre les produits d’origine et leur territoire de production représentent un enjeu de développement. Cet article présente le projet de valorisation d’une spécialité locale, le fromage Serrano, en cours d’étude par une institution brésilienne, l’Emater. Soixante-treize entretiens semi directifs nous ont permis d’évaluer la pertinence d’une indication géographique (IG) dans une optique de conservation de l’identité culturelle du fromage. L’analyse révèle les limites d’un projet descendant (top-down) et suggère les difficultés d’appropriation du sens et des implications de la mise en place d’une IG par l’Emater. Malgré la volonté de valoriser et de revendiquer une histoire et un patrimoine alimentaire, ce label devrait conduire à une standardisation de la production et à une exclusion des producteurs. Il se pourrait que l’indication géographique ne soit pas l’outil le mieux adapter pour sauvegarder le patrimoine alimentaire des Campos de Cima da Serra. Data presented in this article are from a geography PhD research study, ‘Construction of link with origin for traditional food products from Brazil’, supervised by Claire Delfosse (Université Lyon 2) and co-directed by Claire Cerdan (CIRAD). This work is also part of a collaborative project, CAPES/COFECUB n.649/2009, coordinated by the Lyon 2 University (France) and the Rural Federal University of Rio de Janeiro (UFRRJ). Many thanks to the three anonymous reviewers for their valuable comments and stimulating criticism. Warm thanks to Daphne Goodfellow, Jordan Le Roux and Clarisse dos Santos for their English proof-reading. 2 WTO TRIPS Agreement: ‘Trade-Related Aspects of Intellectual Property Rights’. 1The past 100 years have seen European farmers increasingly keen to establish a link between traditional products and their respective places of origin. That link has attracted growing debate since the late 20th century (Delfosse, 1997), not least in the context of globalization (Murdoch et al., 2000; Winter, 2003; Sonnino & Mardsen, 2006). Origin-linking has been much slower to take off in developing countries, which have only recently jumped on the bandwagon (Vitrolles, 2006; Wilkinson & Cerdan, 2008; Marie-Vivien, 2008; Bienabe et al., 2009). Geographical Indications1 (GIs) are a specific strategy to promote and protect the quality of a food product and its link with territory. On the one hand, the use of GI enables producers to obtain market recognition and often a premium price. On the other hand, GI impacts on social, cultural and environmental development (Barjolle et al., 2009; Cerdan et al., 2009). GIs can be instrumental in conserving tradition and transferring know-how and since their definition in the TRIPS2 agreement in the mid 1990s have become an important issue for developing countries. First defined in Brazilian Intellectual Property Law in 19963, GI status has now been awarded to six Brazilian products: wine from Vale dos Vinhedos4, coffee from Região do Cerrado Mineiro, beef from Pampa Gaúcho da Campanha Meridional, cachaça from Paraty, leather from Vale do Sinos5 and recently grape and mango from Vale do Submédio São Francisco. Their success has prompted others to follow suit, with GI recognition now regarded as a potential tool for development by producers across the country. Applications in the pipeline include golden grass handcrafts from Jalapão, wine from Vales da Uva Goethe and Serrano Cheese from Campos de Cima da Serra. This burgeoning enthusiasm for GIs calls for urgent research aimed at raising awareness of their limitations (Niederle & Vitrolles, 2010; Vitrolles, 2006). The Brazilian initiatives launched to date are supported by national institutions that promote origin-linked quality. What these institutions must be made to realize, however, is that the top-down approach common to all of these initiatives could lead to standardization of production methods that would destroy local knowledge (Casabianca & Sainte Marie, 2000; Duboeuf & Delfosse, 2000; Delfosse, 2007). 2Our analysis is based on the Brazilian case study of Serrano cheese – a raw milk cheese from Campos de Cima da Serra, identified by a Brazilian institution as a potential candidate for Geographical Indication. The aim of this investigation was to determine whether or not GI classification posed a threat to food heritage by undermining the traditional diversity at the heart of local food production systems. Serrano cheese is a case in point. Our findings could help to shed light on culinary heritage, encouraging the institutions involved to consider other quality labelling schemes (private or collective trademarks, certifications) rather than deliberately focus on GI. The data presented in this paper are from a PhD research study about linking territory and traditional products from South Brazil. 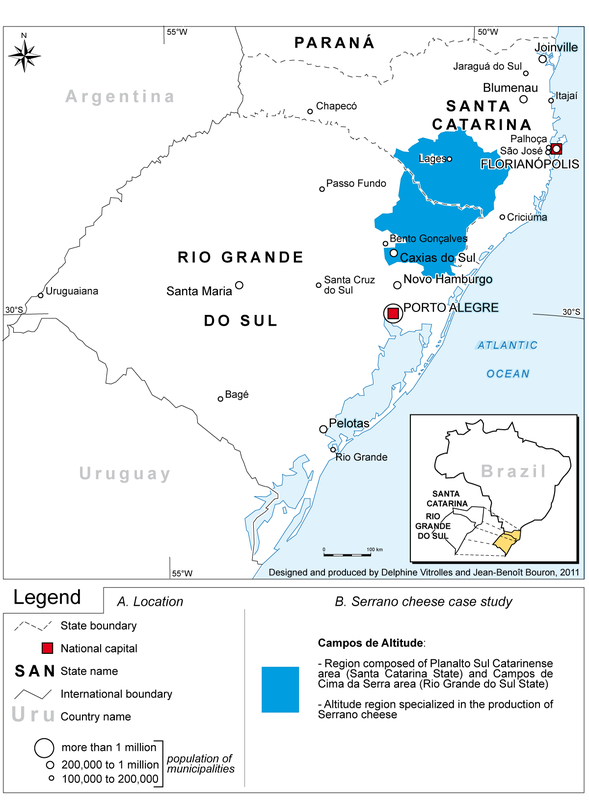 The fieldwork was conducted in 2008 and 2009 in Rio Grande do Sul State as part of a qualitative case study of Serrano cheese. Semi-structured interviews were held with 73 respondents6 who were selected by location and social status (cheese producers, politicians, technicians, vets, merchants, middlemen and people in tourism)7. The research also included participant observation from seminars and workshops and analysis of technical documents, scientific literature and institutional reports. This method was intended to highlight that Serrano cheese could be considered as an origin-based product. Data collection improved understanding of Serrano cheese production, supported by a comparative analysis of interview data showing use and type (ie locally specific or not) of local resources (Colletis & Pecqueur, 1993; Gumuchian & Pecqueur, 2007). Serrano cheese is considered as a local specialty in the area of production and throughout the states of Santa Catarina and Rio Grande do Sul. The case-study fieldwork showed a triple specificity of Serrano cheese based on territory, producers, and methods of manufacture, reinforcing the link between Serrano cheese and its temporal and spatial origins. It also demonstrated the emergence of a new strategy to enhance Serrano cheese value. 3This paper8 focuses on the specificity of Serrano cheese. It starts by describing the history and present conditions of Serrano cheese production. Having established the context, it then introduces the GI system, highlighting present-day initiatives to enhance the value of the cheese as a local specialty. It concludes with a discussion of the effects of the GI system on local producers and Serrano cheese. 4Serrano cheese production is located in the Campos de Altitude region of South Brazil, which encompasses the area of Planalto Sul Catarinense (Santa Catarina State) and Campos de Cima da Serra (Rio Grande do Sul State) – see Figure 1. Campos de Cima da Serra is one of the coldest areas of southern Brazil, with a sub-tropical climate characterized by very rigorous winters. The traditional production area of Serrano cheese extends over 31,500 km2. The cheese is made by an unusual method using the raw milk of newly calved cows, raised for meat, that graze on native pastures. 10 Tropeiros exchanged surplus agricultural production for sugar, manioc flour, cachaça. 6The historical anchorage of Serrano cheese production is very important (Menasche & Krone, 2007; Cruz et al., 2008; Krone, 2009) and closely linked to the settlement of southern Brazil. The discovery of gold mines in Minas Gerais State in the 17th century fostered the development of the trade in livestock (tropeirismo9) and created new trade routes linking the states of Rio Grande do Sul, Sao Paulo and Minas Gerais. These in turn led to the settlement of Campos de Cima da Serra and the development of farming. The mule trade preceded the trade in cattle, geese and eventually processed products like leather, dried meat, cheese, pine nuts and horsehair. Cheese from Campos de Cima da Serra became one element in a very well-organized barter system that supplied farmers as well as tropeiros (Brazilian for ‘cattle-herder’)10. 7Cheese production has been part of daily farming activity since Campos de Cima da Serra was first settled, thought to have developed alongside the raising of brood cows (cf Krone 2009). Then as now, milking the cows once a day helps to keep them tame. Cheese became an important source of income for farming families, even if it was just a by-product. 8One of the oldest written records of Serrano cheese production is from the mid-19th century. In the book Os fundadores de Sao Francisco de Paula, the authortranscribes a petition dated 6 April 1831 signed byCampos de Cima da Serra inhabitants. The petition requests attention to the supply routes running from Campos de Cima da Serra to the coast, arguing for recognition of the quality of local resources: “abundance of brood cows, and the superiority of dairy products [cheese and butter] due to rich pasture meadows” (CACMSAP, 1833 in Alves, 2007: 31). 9Cheese production is a family activity. Traditionally, the men did the herding and milking and the women made the cheese, though recent decades have seen a shift towards a less rigid division of labour. Each family has its own recipe, based on local knowledge and skills handed down through generations of womenfolk (whether grandmothers, mothers or mothers-in-law). “My mother already made cheese and taught my wife when we got married. We use exactly the same method today – only the equipment has changed”11. One major change, courtesy of new technology and consumer demand, is the use of industrial rennet to curdle the milk, not armadillo digestive enzymes as before. “I learnt to make cheese with my mother. I changed a few things. When we began, my mother had been making cheese with home-made rennet. Today, we use only industrial rennet. I remember when I was at my grandmother’s. She had been making cheese with armadillo rennet. Do you know armadillo? She would use the armadillo rennet. But now it is industrial rennet. I remember also my mother used to salt the milk but I prefer brine”12. 10Six different methods of Serrano cheese production have been identified (Emater, 2008). Salting, curd handling, moulding and pressing are the four most variable steps. Some producers salt the milk itself, others salt the curds or cheese. Some producers heat the milk, others heat the curds and others still heat nothing at all. Some producers use only the milk from one milking session; others use the milk from several sessions. Some producers use wooden moulds, others use plastic or stainless moulds – see Figure 2. The pressure applied during cheese pressing varies depending on the weight used. The following figure shows four different systems of pressure, from the most artisanal to the most industrialized. Top to bottom, left to right: stone weight, wooden mould; stone weight stainless steel mould; traditional pressure system but with the weight covered in food-grade plastic to comply with hygiene requirements; stainless steel mould and plastic-covered weight in a home cheese factory. 12Most producers have now switched to plastic or stainless steel moulds for reasons of hygiene and ease-of-use. The cheese itself is also considerably smaller than it used to be. As roads and vehicles have improved, Serrano cheese has shrunk from a big13, round, hard cheese, ripened for several months, to a smaller, soft cheese usually consumed within a few days of ripening (from 5 to 15 days). “First, mules transported cheese, then they started to use trucks. I remember my mother... In the 50s, trucks began to circulate in the region. My mother had to deal with a truck driver. She was selling ripened cheese to him. Truck drivers did not want to buy soft cheese. […] Now, the ripening period has been affected. The cheese size has been affected too. Now it is easier for people to get to rural areas because transport is easier. There is more trade between urban people and rural people. As the ripening period decreased, so did the size of the cheese. I don’t exactly know when it occurred. But according to my experience, I think unripened cheese sales date from the 1980s.”14. 13The traditional production system is based on milk from nursing cows. Breeds are common breeds (Creole breeds). Because of market opportunities or technical orientation, some producers selected dairy breeds using cross or pure diary animals like Jersey or Holstein. The dairy system and the nursing system are quite different. The animals’ needs and the organization of the work (milking) are different. Moreover, the composition of milk varies depending on the breed of cow, feed, climate, and so on (Sutton, 1989; Palmquist et al., 1993). And it is the quality and origin of the milk that gives the cheese its final quality in terms of texture, colour, and flavour (Coulon & Priolo, 2002; Coulon et al., 2005). Traditionally, the cattle grazed on pasture and received occasional supplementary feed (corn). The availability and quality of fodder varied considerably from one location to another. In some farms, it was impossible to feed animals on pasture alone and so farmers began to grow corn for silage. Research shows that feed composition (native pasture meadows, improved pasture meadows, corn silage) influences milk and therefore cheese quality. These days, thanks to genetically-selected animals fed a varied diet, Serrano cheese can be produced all year round. 14Serrano cheese remains a local product, popular throughout the region for its traditional, hand-crafted qualities. People in Campos de Cima da Serra take great pride in their cheese, which still looks and tastes as it always has despite the use of new technology. For them, Serrano cheese is part of their heritage. According to the Institute of National Artistic and Historical Heritage (IPHAN), Serrano cheese is an example of Brazilian intangible cultural heritage. IPHAN defines this as the non-physical cultural legacy that is handed down from generation to generation: practices, ways of seeing and thinking about the world, ceremonies (religious celebrations and rituals), folklore (dances, songs, legends, tales, history, jokes), skills (foods, crafts, etc. ), along with the instruments, objects and places associated with that legacy. Serrano cheese from Bom Jesus is particularly famous. Like so many popular goods, however, Serrano cheese has fallen prey to imitators and consumers must beware of fakes. Take this example of passing-off: “One day, the manager of one hotel where I usually sell my cheese told me that my last delivery had not been as good as usual. A man who identified himself on my behalf had delivered the cheese. I never let anybody sell my cheese except me! Someone had used my name and my reputation to sell lower quality cheese”15. Regional producers and middlemen recognize that others types of cheese like Minas or Prato cheese are sold as Serrano cheese in regional markets. 15Cheese production in Campos de Cima da Serra involves more than 3,500 families, centering on small traditional farms manned by family members. Herds average 91 animals, raised on some 160ha and producing 2.4 tonnes of cheese a year (Emater, 2008), providing a living for the whole family. Cheese is the primary source of revenue for 1,500 producers, representing 40% of their income (Emater, 2008) – see Table 1. This represents useful extra income on a regular basis: while farmers earn money by selling cattle once a year, they sell cheese every week. On the whole, cattle and by-products represent more than 80% of farmers’ incomes. 16Gross annual income of Serrano cheese producers (average values for producers interviewed by Emater in 2007 and 2008). 18Serrano cheese production ranks as the most outstanding feature of local culture, conferring identity on the community at local and national level. While others do trade unfairly off its reputation, this has so far had no impact on sales that remain as buoyant as ever. However to safeguard the cheese’s identity and discourage passing-off, Serrano cheese is currently being assessed as a potential candidate for Indication of Source registration by the Brazilian local government development agency, Emater. 17 ‘Production specifications’ refer to the French expression ‘cahier des charges’. 19Emater’s ultimate goal is to promote local growth and certification initiatives in line with sustainable development. For the past ten years, the agency has been looking for ways to boost productivity on family farms. For Emater’s regional spokesman, “Serrano cheese has been identified as the food product which is the most likely to be certified in the region”. Its potential is due to its reputation, to the regional history of settlement, and to other links with origin (culture, know-how)16. These were the reasons that in 2007 prompted Emater to launch a project aimed at registering Serrano cheese from Campos de Cima da Serra under Brazilian regulations covering the protected designation of origin products. The first priority is to define the production of Serrano cheese in order to legalize it, but the main objective is to obtain official recognition of the cheese as an Indication of Source. Definition entailed four stages of research: historical exploration of Serrano cheese production; market and supply-chain assessment; product and process profiling; and characterization of the cheese’s physical, chemical, sensory and microbiological properties. Once all the findings have been finalized, Emater will be in a position to propose production specifications17 (code of practice) and apply to the National Institute of Property Rights for GI registration. The case study confirms the top-down nature of the process. 20We shall go on to discuss the relevance of classifying Serrano cheese production, the limits of Emater’s strategy and the effects of the GI system on local producers and product. Serrano cheese is regarded as a local product that is rooted in its territory of origin. To discourage passing-off and to legalize production, Emater has designed and is now implementing a new strategy (GI) to enhance the value of the cheese. While GI is a useful tool to safeguard food heritage, it cannot always account for the full range of skills involved (production tools, recipes). In the case of Serrano cheese, our starting hypothesis was that GI may conflict with safeguarding food heritage. To verify this hypothesis, we examined several aspects of the GI project, starting with an analysis of production specifications in terms of their compatibility with food-heritage criteria. Next we questioned the logic of a top-down project in the context of such a poorly organized community of producers whose status hangs in the balance. 21When producers implement a quality label, they are required to codify production standards. According to Casabianca & Sainte Marie (1997), codification gives existing practices a new status they did not previously enjoy. Likewise, producers implementing a Geographical Indication must codify production standards by creating product specifications. Generally, “the relevance of the technical product definition to the product specifications (codification) is linked with project members’ motivation, process initiators, and the consistency of these motivations with contextual and commercial stakes” (Barjolle, 2006: 11). However, the Serrano cheese project follows a top-down approach: it arose from an institutional initiative that did not involve producers. The mode of production along with the cheese’s physical, chemical, organoleptic and microbiological properties, were all defined by Emater. Producers were not made privy to the rationale behind quality labelling – Emater asked only a handful of them for permission to take samples of cheese, soil, silage, and water. Studies of Serrano cheese highlight a wide range of different practices that call into question the realism of the production specifications. What production area? Which recipe? Which breeds? What feed regime? All of these questions are crucial because they fuel the current debate about local foods. 22Serrano cheese production, in common with that of many other local products, varies widely from one producer to another (cf Bérard & Marchenay 2004). Six different methods of production have been identified, with four basic areas of variation: salting, curd handling, moulding and pressure. This plus milk from genetically selected cattle leads to significant variations in the texture of the cheese. 19 Regulation 146/1996 defining technical standards for dairy products. 23Historical research (documents and interviews) identified eleven places18 where Serrano cheese was formerly produced. Emater limited the production area to just six: “the six places where we concentrated our work represent more than 90% of Serrano cheese production”. It is interesting to note that there are two main reasons for these shrinking boundaries, the first being Emater itself. Some 15 years ago, Emater technicians provided courses for regional cheese producers on Good Manufacturing Practices (GMFs). What they realize today is that in learning GMFs, producers were in fact taught to make cheese from pasteurized milk, such as colonial cheese from southern Brazil – not Serrano cheese that does not comply with the minimum 60-day ripening period and is therefore not authorized for sale at local or national level19. Women from Campos de Cima da Serra who learned GMFs were encouraged to use production methods incompatible with Serrano cheese production, at the expense of local skills and cultural identity. The second reason that the production area has shrunk is farm succession. The younger generation shows little interest in taking over from their parents, generally preferring an urban lifestyle to rural living (Silvestro et al., 2001). Moreover, there is nothing straightforward about raw milk cheese production. The qualities of food products like Serrano cheese are linked with traditional, historical and cultural aspects, but may require particular skills or techniques that conflict with hygiene requirements. Today, such products increasingly fall foul of newly-adopted standards of hygiene and tax practice (Ricard, 1998; Bérard & Marchenay, 2008; Cruz et al., 2008). Consumer habits have also changed. Serrano cheese does not comply with Brazilian regulations banning the sale of raw milk cheeses that have not been aged for at least 60 days. Violators face prosecution and even the loss of the production – a prospect that the younger generation is unwilling to confront. As their children turn away from farming, producers often stop producing cheese altogether. 24Delimiting the production area is therefore a sensitive matter for Emater technicians and cheese producers alike. Both must comply with GI requirements that make it difficult to arrive at a realistic basis for delimitation. Either Emater should delimit the area to protect the families who produce the cheese today. Or it should include former production areas in a bid to restore ‘lost’ food heritage. 25To qualify for certification, Emater and producers need to work together on production specifications. GI implementation does however lead to standardization of production practices; product labelling tends to interfere with the development of local knowledge, reducing spatial and seasonal variability (Boisvert & Caron, 2007). Certification may well turn Serrano cheese from a home-made cheese into one that is industrially made (Boltanski & Thévenot, 1991). As Krone says (2009: 46): “Today, artisan production of Serrano cheese is quite unlike industrial processes of food production. Industry looks for extremely standardized products and not for diversity”. 20 French law of 28/11/1955, modified and completed by the law of 06/07/1966. 21 Translation of “Appellations d’Origine”. 26The quality certification of Serrano cheese forms part of an institutional project. The creation of product specifications and criteria for classification have to be considered with the utmost care because: “When the certification process is not controlled by local players, or at least when local players do not participate in the process with a recognized equal status, certification may lead to the expropriation of local knowledge and the beneﬁts deriving from its enhancement by players from outside, rather than the integration or synthesis of local and scientiﬁc knowledge” (Fonte, 2008: 214). In other words, Serrano cheese is subject to the same requirements as French cheeses in 1955 following the passing of legislation20 defining ‘designation of origin’21 for cheese. Cheese designation of origin has been defined by the delimitation of a production area and the definition of the conditions of production and ripening. In Cheesemaking France, Delfosse (2007: 105) explains that even if the law recognizes the “special nature of terroir products, it leads to a certain standardization because producers who seek designation have to present product specifications that strictly define the cheese’s characteristics”. Product specifications (area delimitation, practices) are one step in GI implementation. In creating rigorous product specifications for Serrano cheese, regional food heritage would be affected. 22 Translation of “Appellation d’Origine Contrôlée (AOC)”. 27“How not to reduce this diversity when producers should opt for a practice, a production method, an ingredient, a recipe rather than another in the frame of legal protection?”(Bérard & Marchenay, 2004: 83). Poméon et al. observed similar problems with Cotija cheese in Mexico. For these authors, “the justification of delimitation of the production area and studies of links between the product and its territory are often superficial”: Neither product characteristics and production processes nor territorial anchorage of product characteristics and practices are satisfactory (Poméon et al., 2009: 8). But GI implementation is as much the result of claiming links with territory as with specific production practices and know-how. For Delfosse (1997: 220), this claim needs to mobilize “geographical knowledge, especially when it is a question of area delimitation”. In other words, area delimitation and the codification of working practices refer to climate and soil characteristics, culture and history, production system features, know-how, skills and the social organization of local players (producers, traders, technicians, and so on). 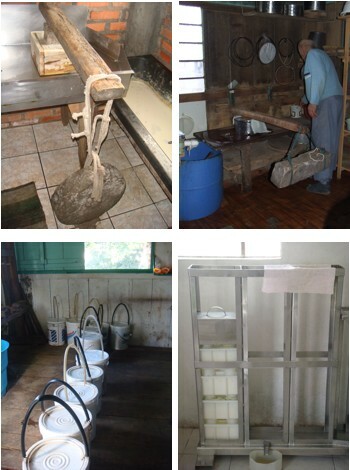 In Rio Grande do Sul State, Emater clearly defined the characteristics and production processes of Serrano cheese but failed to look closely enough at the knowledge and different working practices entailed. The area should be delimited so as to include the largest possible number of producers, and satisfy local players as to the legitimacy and credibility of classifying Serrano cheese as a GI. Failing that, Serrano cheese faces the same fate as French ‘chevrotin’ from the Alpes du Nord department, which acquired AOC22 status at the expense of its diversity and a good many local producers. 28Emater did not take into account each category of player. Take middlemen, for instance. While the producers themselves usually supply local markets (formal or informal), the middlemen handle markets further afield. The advantage of this sort of trade is the informal supply chain: there are no taxes. The classification of Serrano cheese production will modify the status of intermediaries, blurring the lines between supply-chain members. Then there are the producers themselves. Today, producers are not organized, but operate on an informal basis, producing an “outlawed” dairy product. Each category of local player has different objectives. On the one hand, Emater wants to develop a GI to organize the cheese supply chain and help producers obtain added value and social recognition. On the other hand, producers have no real demand in the matter. Interviews highlighted the fact that the GI concept is misunderstood. Even Emater technicians tend to confuse the European GI labelling system with trademarks. Very few of them have grasped the full implications of GI, and producers, with little education to speak of, have little hope of understanding GI at all. Few people understand that GI requires compliance with product specifications and hygiene standards that may simply not be compatible with traditional modes of production and consumption. GI began as the primary objective of a top-down project. But to qualify for GI classification, producers will first have to legalize their production structure. For Cruz et al. (2008), Emater must first take into account the scale and regional diversity of cheese production in a bid to avoid the standardization of a traditional product. Note that, to comply with regulations, producers will have to build a cheese factory. Such a construction raises four issues: (i) it changes the social status of producers from farmer to entrepreneur; (ii) it requires considerable investment; (iii) it questions the scale of cheese production; and (iv) it fails to solve the problem of distributing cheese from Rio Grande do Sul to Santa Catarina State. Under Brazilian law, farmers are only entitled to sell unprocessed raw material. Selling processed products like cheese gives them the status of an enterprise, making them liable to pay the ICMS tax23 while also removing their entitlement to a farmer’s pension. Farmers whose children turn their back on the land hesitate to invest in a new production structure. Rural-urban migration is one of the topics for consideration by Emater technicians in the framework of the qualification project. It is pointless spending vast sums on the preservation of a small-scale production system – particularly when this would only benefit one generation. Brazilian hygiene inspection procedures operate on three levels: i) a municipal inspection system for farmers who sell their products within the locality; ii) a state inspection system for farmers who sell their products within the state; and iii) a federal inspection system for farmers who sell their products throughout Brazil. Emater tends to recommend the municipal inspection system for small family farmers who will take part in the project. But those who want to extend their distribution channel will approach tourist markets and outlets on the coast. Tourist markets are not located in the production area and coastal markets are in Santa Catarina State. Even with municipal inspection, Serrano cheese production will still be informal. 29In other words, the Serrano cheese supply chain is either completely unstructured or informal. While the regional impact of GI implementation would be significant, the feasibility of such a project remains questionable. Do local farmers want to legalize their production? Do they want to organize themselves? Can a GI solve all of their problems? Since 1996, the Brazilian government has recognized six GIs, which have been described as the new tool to enhance the value of quality food products that preserve the link with their origin. “The use of geographical indication to indicate an origin product is a step forward in the process of product enhancement and results from the behaviour of the players concerned (local and non-local)” (Thevenod-Mottet, 2006: 9-10). The Brazilian National Institute of Industrial Property is very strict about who can apply for a GI. The first stage in the procedure is producer organization. “GI requires the committed participation of producers, processors and others stakeholders”. Serrano cheese producers are not yet organized, with no artisans’ association to protect and manage the specific nature of production. Regional producers are known for their individualism. Farms tend to be isolated, far from urban centers and generally inaccessible. Asphalt roads are few and far between, and drivers have to be careful not to burst a tyre on impracticable tracks. Given the huge production area (14,500 km2), few of the 3,500 producers have ever met. And in the absence of a leader, Emater’s attempts to create an association have so far proved unsuccessful. 30In the first stage of the project, Emater should enable family farmers to fulfil the main hygiene requirements (cheese factory, cheese utensils). Note however that there are only enough Emater technicians - zoology field technicians, agronomists and veterinarians – to provide technical assistance to some 400 of the 3,500 or so producers. Those who benefit from Emater‘s assistance are generally more modern, more attentive and open-minded. But Serrano cheese remains parts of the local identity despites changes in processing, passing-off and others difficulties to do with hygiene standards and tax requirements. “Serrano cheese is very important for regional development. It is a marker of regional identity, farming, culture, and of a way of life. It is the marker of Bom Jesus and Campos de Cima da Serra. Why do we speak of ‘Serrano’ cheese? Not because of the Serra, but because the cheese comes from Campos de Cima da Serra. Why? Because the people of Campos de Cima da Serra have a tradition of milking and cheese making, aging and ripening. Now the ripening period has changed. But Serrano cheese is our regional marker. That’s for sure. Other than its economic importance, it is a marker of our identity”24. 31Emater’s objective is still “to preserve culture and know-how”. However GI implementation always carries the risk of exclusion and, in this particular case, it may well be the majority of producers who are forced out of business. With a better understanding of the implications of GI, Brazilian institutions like Emater might not be so quick to disregard other quality-labelling strategies (private or collective trademarks, certification). We can only hope that before Serrano cheese is awarded GI status – as seems likely in the future – all of these issues will have been resolved in such a way as to preserve the livelihoods of the producers and the diversity of their skills. 32This study analyzed how GI may or may not reduce the diversity of food heritage, focusing on Brazilian Serrano cheese. Serrano cheese is a local product with a strong food heritage that contributes to local identity. In spite of the desire to preserve the cheese’s identity, GI implementation seems to lead to standardization at the expense of diversity. Loss of diversity is a normal consequence of GI implementation. But in the case of Serrano cheese, defining product specifications appears to be impossible without cutting out family farmers altogether and jeopardizing the identity of the cheese. In others words, GI could achieve exactly the opposite of what Emater wishes to accomplish: instead of protecting the special character of a traditional product, GI may well conflict with safeguarding food heritage. By defining rigorous product specifications, Emater would rule out production as it now stands. This is what happened to the Brazilian beef GI, Pampa Gaúcha da Campanha Meridional – even the breeders themselves find it impossible to apply product specification criteria (Cerdan et al., 2009). Beef production volumes remain down despite GI recognition. Which is not to say that product specifications should be too broad either – take the case of Cantal cheese. Its product specifications are so broad that the traditional breed of cow is rarely used these days and the cheese has lost most of its original features (ripening period, colour, taste, etc). For the time being, hand-crafted Serrano cheese is subject to a top-down process: farmers are not fully involved in the project. Emater needs to realize how vast the cheese production area actually is and that Brazilian legislation is in this respect draconian. Family farmers need to be better integrated in the qualification process. Technicians and family farmers need to ask themselves whether GI is the most appropriate strategy, or whether other labels would be more suited to safeguard Serrano cheese as a food heritage. For other food products, Brazilian producers have opted to use other promotional strategies such as trademarks or organic labelling. For instance, producers of wine at high altitudes in Santa Catarina have chosen a collective trademark to promote their wine. Producers of hand-crafted Minas cheese have been recognized by IPHAN as an intangible cultural heritage. In terms of international research into local products, the Serrano cheese case study is quite original. It confirms the impact of GI on the definition (and development) of production areas and on working practices. In some cases, GI reduces and conflicts with the special nature of food heritage. Chevrotin cheese is a case in point. The granting of Controlled Designation of Origin to Chevrotin forced producers in two separate areas (Mont-Blanc and Bauges) to change their working practices or relinquish their right to use the term “Chevrotin” (Bérard & Marchenay, 2004). ALVES L. A., 2007, Os fundadores de São Francisco de Paula, Edition of the author, Caxias do Sul, 220 p.
BERARD L. & MARCHENAY P., 2008, « Les productions traditionnelles aux prises avec les normes sanitaires », Economies et sociétés, série « Systèmes agro-alimentaires », 30, 2273-2284. BERARD L. & MARCHENAY P., 2004, Les produits de terroir entre cultures et règlements, CNRS Editions, Paris, 229 p.
BIENABE E., LECLERCQ M. & MOITY-MAÏZI P., 2009, « The rooibos from South Africa: how biodiversity invites itself in the design of a geographical indication », Autrepart, 50, 117-134. BOLTANSKI L. & THEVENOT L., 1991, De la justification. Gallimard, Paris, 483 p.
CASABIANCA F. & SAINTE MARIE C. (de), 2000, L’évaluation sensorielle des produits typiques.Concevoir et Instrumenter l’épreuve de la typicité, In the 67th EAAE Seminar, The socio-economics of origin labelled products in agro-food supply chains: spatial, institutional and co-ordination aspects, Le Mans, France, Paris Inra ESR, Parle Universita degli Studi di Parma, 269-276. CERDAN C., VITROLLES D., DELFOSSE C., VELLOSO C. Q., NABINGER C. & SILVA A.L., 2009, « Penser la conservation des ressources bioculturelles sous l’angle de la valorisation de l’origine : la mise en place d’indications géographiques dans le Sud Brésil », Autrepart,50, 153-166. COLLETIS G. & PECQUEUR B., 1993, « Intégration des espaces et quasi intégration des firmes : vers de nouvelles rencontres productives ? », Revue d'Economie Régionale et Urbaine, 3, 489-507. COULON J.B., DELACROIX-BUCHET A., MARTIN B. & PIRISI A., 2005, « Facteurs de production et qualité sensorielle des fromages », Productions animales, 18, 1, 49-62. COULON J-B. & PRIOLO A., 2003, « Sensory properties of meat and dairy products are affected by the forages consumed by the animals », Productions animales, 15, 5, 333-342. DELFOSSE C., 2007, La France fromagère (1850-1990), Boutique de l'Histoire, Mondes ruraux contemporains, Université de Lyon-INRA, 2007, 271 p.
DELFOSSE C., 1997, « Noms de pays et produits de terroir. Enjeux des dénominations géographiques », L’espace géographique, 4, 220-230. DUBEUFB. & DELFOSSEC., 2000, Quels enseignements tirer des modifications des aires deproduction des fromages AOC pour éclairer la question de l’argumentaire de délimitation?, In The Socio-economics of Origin Labelled Products in Agri-food Supply Chains :Spatial, Institutional and co-ordination Aspects, INRA, Actes et communications du département ESR, 17, 387-392. EMATER, 2008, Relatório final do projeto de qualificação e certificação do queijo artesanal Serrano dos Campos de Altitude do Rio Grande do Sul, Emater, Final report, 34 p.
FONTE M., 2008, « Knowledge, Food and Place. A Way of Producing, a Way of Knowing », Sociologia Ruralis, 48, 3, 220-222. GUMUCHIAN H. & PECQUEUR B., 2007, La ressource territoriale, Ed. Economica, Paris, 252 p.
KRONE E.E., 2009, Identidade e cultura nos Campos de Cima da Serra (RS): práticas, saberes e modos de vida de pecuaristas familiares produtores do Queijo Serrano, Mestrado em Desenvolvimento Rural (UFRGS/PDGR), 147 p.
MARIE-VIVIEN D., 2008, « From Plant Variety Definition to Geographical Indication Protection: A Search for the Link Between Basmati Rice and India/Pakistan », The Journal of world intellectual property, 11, 4, 321-344. MURDOCH J., MARDSEN T. & BANKS J., 2000, « Quality, Nature, and Embeddedness: Some Theoretical Considerations in the Context of the Food Sector », Economic Geography, 76, 2, 107-125. NIEDERLE P.A. & VITROLLES D., 2010, « Indicações geográficas e qualificação no setor vitivinícola brasileiro », Estudos Sociedade e Agricultura, 18, 1, 5-55. PALMQUIST D.L., BEAULIEU A.D. & BARBANO D.M., 1993, « Feed and Animal Factors Influencing Milk Fat Composition », Journal of Dairy Science, 76, 6, 1753-1771. RICARD D., 1998, « Produits de terroir et normes de fabrication. Les fromages d’AOC face aux nouvelles exigences sanitaires », Revue de géographie alpine, 86, 4, 103-114. SILVESTRO M.L., ABROMOVAY R., MELLO M.A. (de), DORIGON C. & BALDISSERA I.T., 2001, Os impasses sociais da sucessão hereditária na agricultura familiar, Epagri, NEAD/ Ministério do Desenvolvimento Agrário, Florianópolis, Brasília, 102 p.
SONNINO R. & MARDSEN T., 2006, « Beyond the divide: rethinking relationships between alternative and conventional food networks in Europe », Journal of Economic Geography, 6, 181-199. SUTTON J. D., 1989, « Altering milk composition by feeding », Journal of Dairy Science, 72, 10, 2801-2814. THEVENOD-MOTTET E., 2006, GI legal and institutional issues. Sinergi, WP1 Report. 53 p.
VITROLLES D., 2006, Construction sociale des Indications Géographiques au Brésil, Mémoire de fin d’études (ISARA-Lyon, CIRAD), 111 p.
WILKINSON J. & CERDAN C., 2008, A Brazilian perspective on geographical indications, Meeting abstract, Paper presented at the SINER-GI Final conference, June 23-24, 2008, Geneva (Suisse). WINTER M., 2003, « Embeddedness, the new food economy and defensive localism », Journal of Rural Studies, 19, 23-32. 1 Word Trade Organization (WTO) defines geographical indications as place names used to identify the origin and the quality, the reputation or other characteristics of products. 3 Brazilian Intellectual Property law (9.279/96) defines two types of GIs: Indication of Source (Indicação de Procedência) and Designation of Origin (Denominação de Origem) recognized by the Brazilian National Institute of Property Rights (INPI). 6 Our sample was not statistically representative but gives an idea of the dynamics within the territory. Our objective was to understand the dynamics and not to measure or quantify. Some producers were identified by local institutions, others were picked at random. 7 Interviews followed a seven-point plan: (i) producer description; (ii) land and administrative characterization of the unit of agricultural production; (iii) basic infrastructure; (iv) characterization of vegetable-production system; (v) characterization of livestock-production system; (vi) characterization of cheese production (process, marketing, quality, territory, link with origin, community life, institutional support); (vii) producer perceptions of quality label implementation and future. 8 This article is based on a paper presented at the International Symposium ‘Localizing products: a sustainable approach for natural and cultural diversity in the South?’, Paris, 9-11 June 2009, UNESCO, organized by CIRAD, IRD, Mab/UNESCO and the MNHN.The author would like to thank symposium participants for their constructive feedback. 9 Tropeirismo, from tropeiro or cattle herder. Since the 17th century, tropeiros have been moving livestock (mules, horses, cattle, geese) from production regions to consuming regions. 13 Tropeiros visited the farms two or three times a year. The bigger the cheese, the better it ripened and kept in storage. 18 Vacaria, Ipê, Campestre da Serra, Monte Alegre dos Campos, Bom Jesus, São José dos Ausentes, Cambará do Sul, Jaquirana, São Francisco de Paula, Caxias do Sul. 23 ICMS: Imposto sobre Circulação de Mercadoria e sobre Prestação de Serviços (tax on circulation of goods and services).